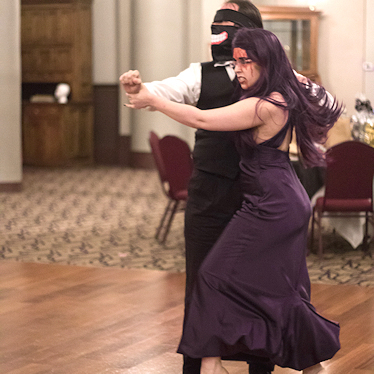 I'm passionate about changing the "formal ball/dance/event" community within the anime convention community to be a safer, more enjoyable, and more educational space. I want to teach lessons that accommodate every kind of dancer regardless of age, ability, experience, orientation/identity, partner acquisition, and any other factor that might hinder someone from enjoying dance elsewhere. At any event I host, I use my knowledge of BPM and movement sensitivity to craft a playlist that can be enjoyed by all. Credits: photography by Morylaine, featuring Benjamin Wright-Heuman. All original content on this site is © by Trickssi, all rights reserved. Full notice here. Learn a little more about why this is so important to me. Information from my dance panels. Carefully selected playlists from previous events. Find out where I will be teaching dance or DJing next! Images from previous events & workshops. My collaborations with other instructors & cosplayers. Not unlike the song from Broadway's Chicago, I can't do it alone! If you've really enjoyed the dance lessons, you can buy me a cup of Ko-fi!